Congressional Leaders Hopeful As Fiscal Cliff Deadline Nears : It's All Politics Even though the top four congressional leaders left their White House meeting with the president separately and silently Friday, they cast the hourlong encounter in a positive light back at the Capitol. 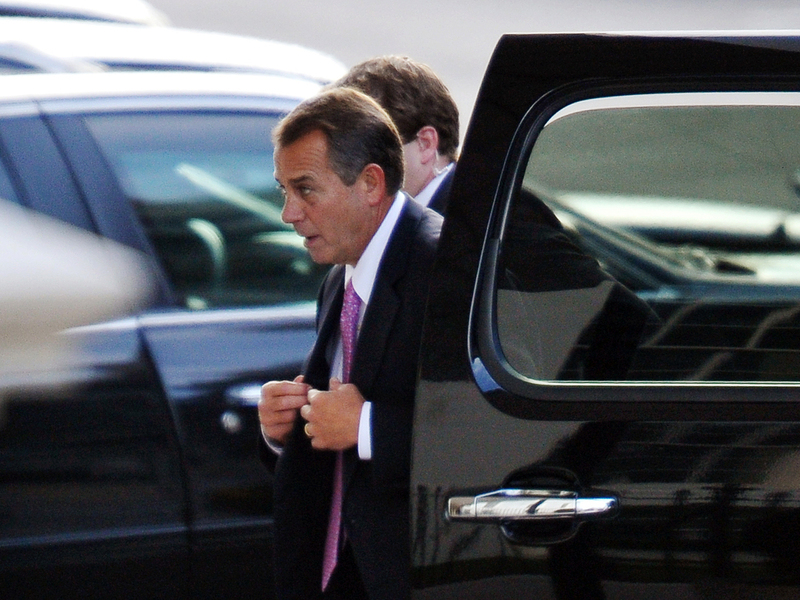 House Speaker John Boehner arrives at the White House on Friday for talks with President Obama and congressional leaders aimed at avoiding the "fiscal cliff." Even though the top four congressional leaders left their White House meeting with the president separately and silently on Friday, they cast the hourlong encounter in a positive light back at the Capitol. House Minority Leader Nancy Pelosi described the tone of the discussion to head off across-the-board tax hikes and spending cuts as "candid." An aide to House Speaker John Boehner put out a statement that noted that the group agreed the next step should be the Senate's — a tacit acknowledgement that Boehner is no longer the lead negotiator with President Obama. 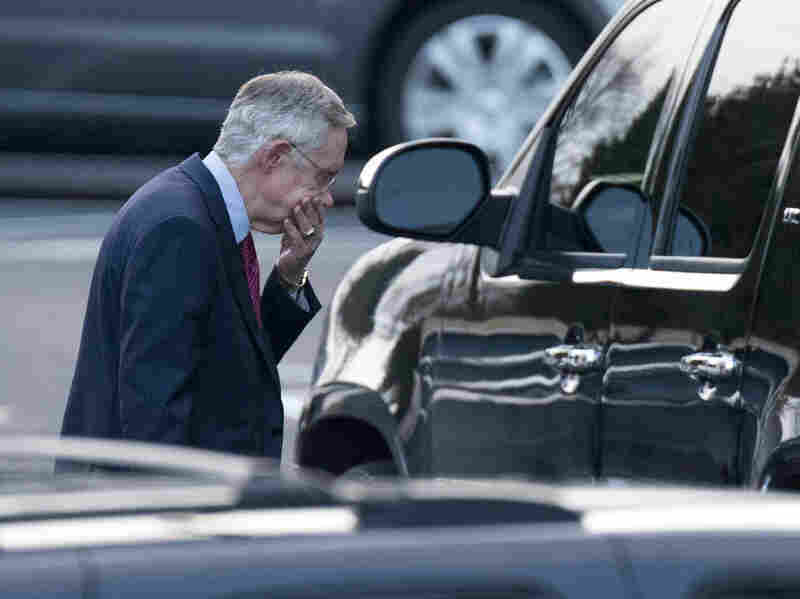 "It was very constructive," said Sen. Harry Reid, who leads the Senate's Democratic majority. "We hope that it will bear fruit, but that is what we've hoped a lot. I think that the next 24 hours will be very instructive as to what we're able to accomplish." Republicans had been predicting that President Obama would be presenting them with a new proposal, but Reid told reporters that did not happen. "We talked about a lot of things, [but] there's no concrete proposal at this time," he said. "We have a number of different directions we're going to try to take and we're going to see what can be worked out." On the Senate floor, Republican leader Mitch McConnell dropped the verbal attacks he's been making on Democrats in recent days; instead, he struck a conciliatory tone, hopeful perhaps that Congress might actually avoid a fiscal cliff debacle for which Republicans might well be blamed. "We are engaged in discussions — the majority leader and myself and the White House — in the hopes that we can come forward as early as Sunday and have a recommendation that I can make to my conference and the majority leader can make to his conference," McConnell said. "I'm hopeful and optimistic." Later, Reid's office put out a statement saying that at the request of the president, he would draft legislation to be voted on by Monday, the last day of the year. That legislation would extend expiring tax cuts only for household income below $250,000 and include other unspecified provisions that Reid said the president wanted; among them is likely an extension of emergency unemployment benefits that would otherwise expire. Reid indicated he was willing to see that bill changed in negotiations with McConnell. Republicans want tax cuts extended for income higher than $250,000, they want no increase in the estate tax, and they do not want the top tax rate to go back up near 40 percent. Senate Majority Leader Harry Reid of Nevada leaves the White House after a closed-door meeting with the president and congressional leaders. On the Senate floor, Reid sounded a warning to his colleagues. "I'm going to do everything that I can," he said. "I'm confident Sen. McConnell will do the same, but ... whatever we come up with is going to be imperfect, and some people aren't going to like it. Some people will like it less, but that's where we are." So as the least productive Congress in memory comes to a close, a new-found spirit of compromise began to pervade the gloom of a rare post-Christmas session of the Senate. Retiring Texas Republican Kay Bailey Hutchison went to the Senate floor with a message for her colleagues: What they do this long weekend before New Year's will not be forgotten. "It will be remembered about the president's term and will be remembered by members of Congress, if we actually don't do something that is a compromise because at this point, it has to be bipartisan," Hutchison said. "There's no question that something has to pass the House and the Senate with votes from the minority party." If such a bipartisan bill does not come together by Sunday, when both the House and Senate meet again, Congress will have to confront the proposal of a re-elected president who has public opinion on his side.